Radishes are cruciferous vegetables that are added to all kinds of dishes and salads and are often considered a type of garnish. Radishes are red, crunchy and contain vitamins and minerals that are good for your health. Adding radishes to your diet can also promote weight loss if you combine this food with other positive meal choices. Radishes are low in calories and if you replace some of your regular snacks that may be high in fat and calories with them, you will be consuming less. Vegetables, particularly when eaten raw or with little added fat or sauces, are low in calories but can be filling. Replacing foods that are high in fat and sugar with vegetables such as radishes will naturally reduce some of your caloric intake. 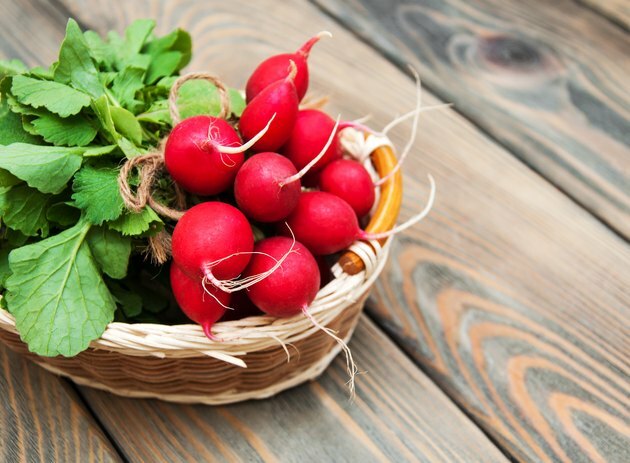 One serving of 1/2 cup of radishes has only 12 calories. A half cup of radishes contains 1 g of fiber, which is important for weight loss: fiber not only helps to lower cholesterol by binding to low-density lipoproteins (LDLs), increasing your fiber intake may help you to lose weight. Fiber is a portion of the plant that goes undigested and when you eat foods with plenty of fiber, you feel full longer. By eating radishes, you can add some fiber to your diet and work toward the daily recommended intake, which is 25 to 38 g each day for adults age 19 to 50. Eating foods that have a low glycemic index, such as radishes, may help you to lose weight. The glycemic index of a food is based on how long it takes to break down and digest in the body. Foods that have a high glycemic index break down quickly and can cause a rapid rise in blood sugar after a meal. The body responds by secreting more insulin to counteract the high blood sugar. Too much insulin inhibits the fat-burning processes in the body, and may actually cause your body to store more fat. Eating foods that have a low glycemic index will help to maintain stable blood sugar patterns, avoiding the rapid rise and fall of insulin and glucose in the bloodstream. Although radishes are low in calories and provide some important nutrients for your health such as potassium and vitamin C, weight loss involves controlling calories through portion sizes and increasing your intake of vegetables — such as radishes. By decreasing your calorie intake by 500 each day, you can lose up to 1 lb. of weight each week. Adding radishes to a balanced diet, avoiding fad diets and increasing your activity levels each week can all contribute to weight loss.